Lenet here and this time I bring you this Layout. I didn’t use one specific collection this time , almoste every piece of of paper I used for this layout are leftovers I saved from other projects I made. Except for the base /background , for this I used Monochromes shades of Celebration -Vintage Teal and Shades of Sofiero White/Sand. I always keep every snippet , it’s such a waste to throw away these lovely papers. I always will find a use for it , I deal for making cards or like this a layered layout. You can tuck them behind another piece and create the illusion of a larger piece that is peeking out a little from underneath it. Here I have some close up for you. The little frames come from the local dollarstore. The white sticks come from my own stash , I found them between my Christmas decorations . Thank you very much for visiting , I hope I gave you some inspiration with my layout. Hello and welcome back to the home of Maja Designs. 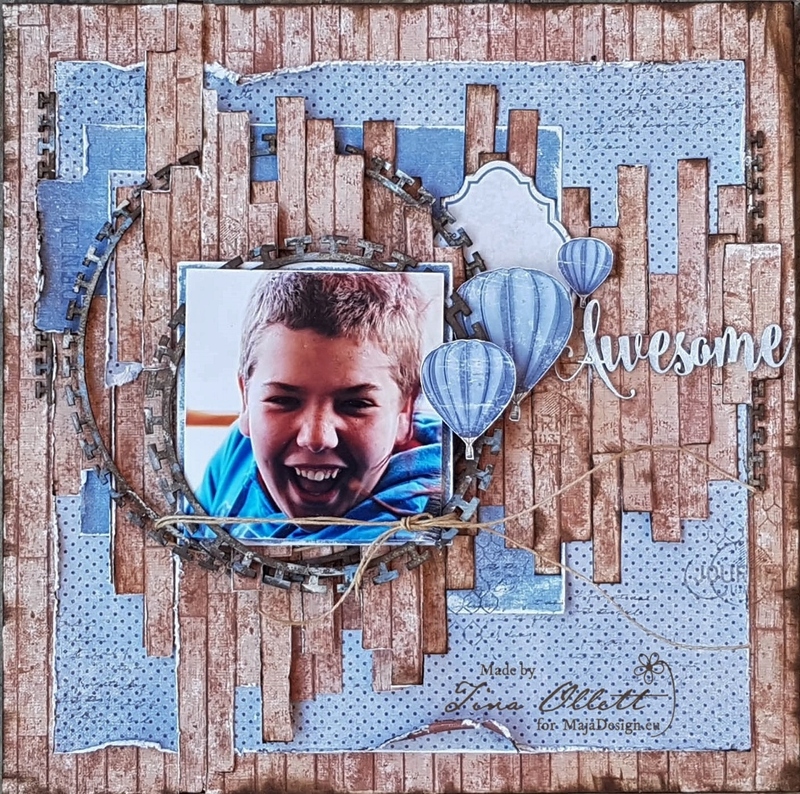 Tina Ollett back with you today to share my first layout using the gorgeous new collection of “Denim and Friends”. Opening my box of goodies from the lovely ladies at Maja Designs was a definite hightlight of my week. 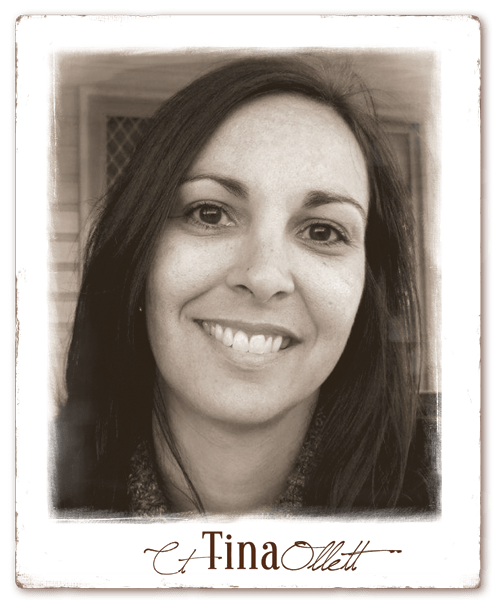 My squeals of pure joy and excitement brought a number of my family members walking down to the art room to find out exactly what was going on. 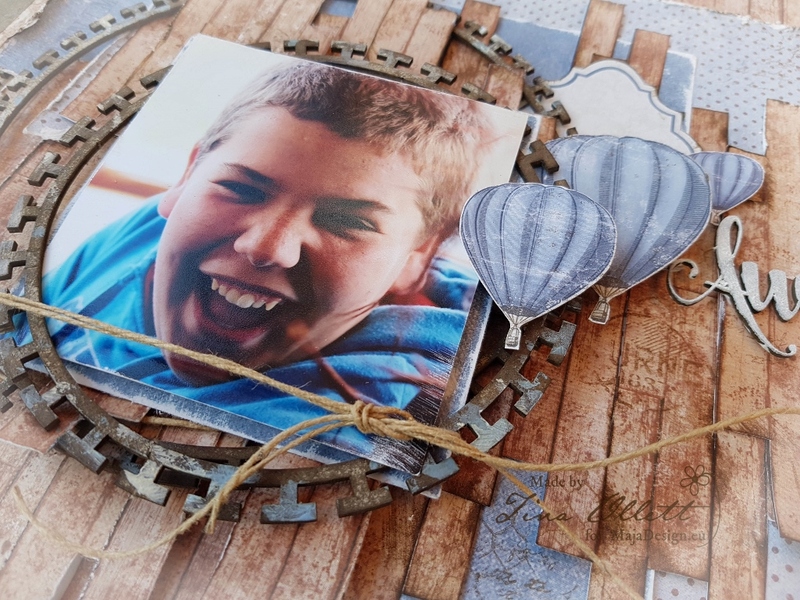 Doing pretty layouts with copious amounts of flowers and embellishments is my go to thing for most projects, but today because this is mainly a masculine paper collection, I have opted to use a photo of my son who is quite happy not to be the centre of attention ever especially in my scrapbooking, but today it is! I captured this photo of him a number of years ago whilst we were on holidays at the Great Barrier Reef. We were on our way out to the reef on a very windy day and he was so very excited to be going snorkeling. The photo says it all. I decided to keep this layout very simple with layering of all this fabulous collection. 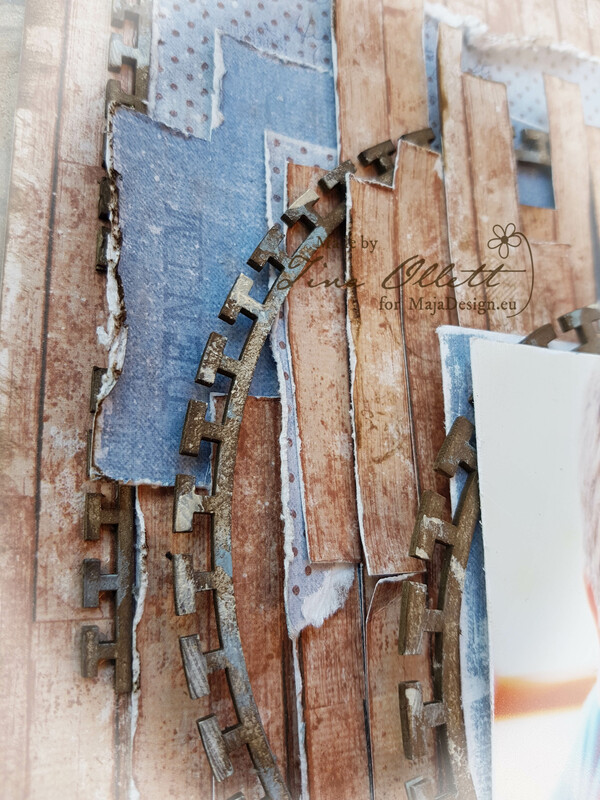 Of course I love to use woodgrain patterns to custom make the design for my chipboards and photo to sit. I used 2 sheets of Wood to create this using the first for the background page. I have also added in the bs of Leather ( I also love polkadots) as a square frame to sit all of the cut wood to sit upon. And over this I have cut sections of Stonewashed to lay over this. My photo is also matted with Stonewashed. 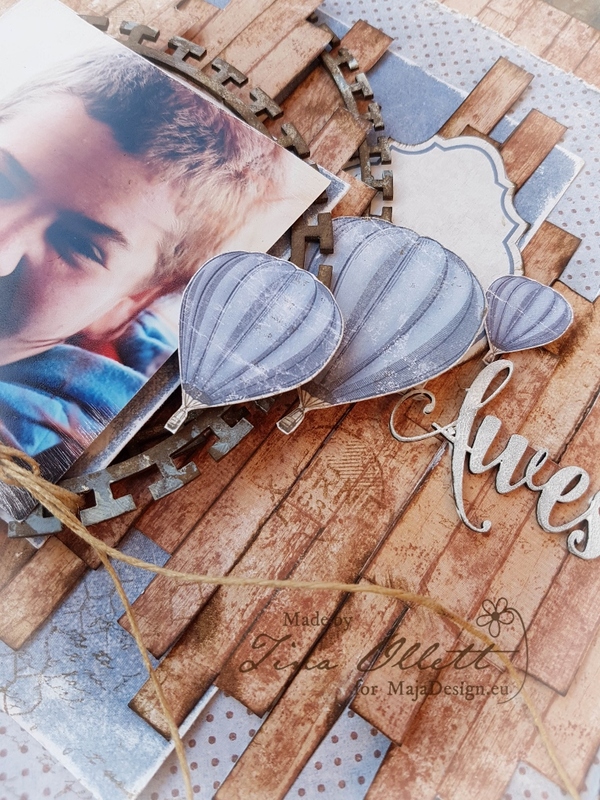 I have also used sheets of papers from the Vintage Autumn Basics collection, cutting some of the hot air balloons for embellishments to add to my project. 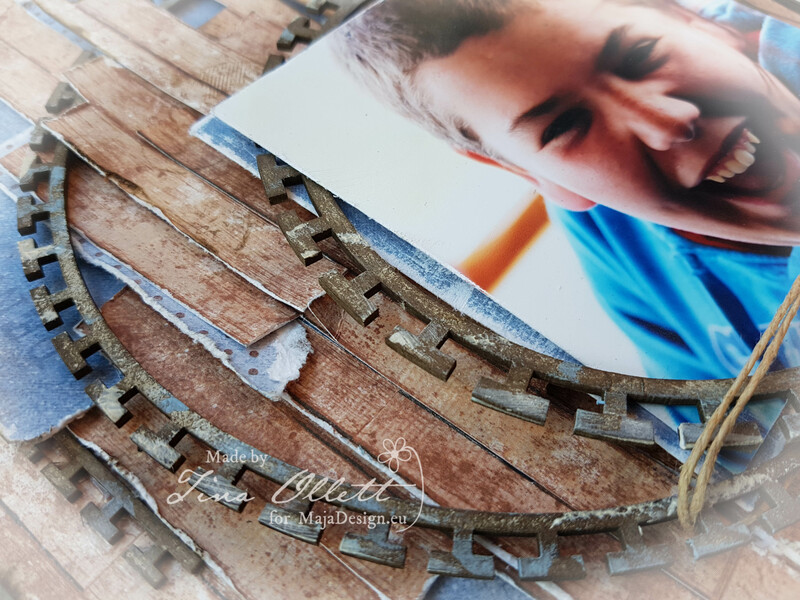 I have also used lots of yummy Dusty Attic chipboards to emphasise my photo. These were inked and painted and layered amongst the layers of papers to allow more dimension to my layout.